The BRK Model No. SC7010BV is a wire-in, 120V AC 60Hz single and/or multiple station combination smoke and carbon monoxide alarm specifically designed for residential and institutional applications including sleeping rooms of hospitals, hotels, motels, dormitories and other multi-family dwellings as defined in standard NFPA 101. Model SC7010BV complies with UL217 and UL2034, CSFM, NFPA 72 and NFPA 720, HUD, FHA and other agencies that model their codes after the above agencies. 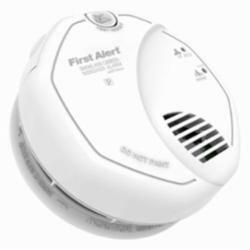 It meets building codes where AC/DC photoelectric smoke and carbon monoxide alarms with and without voice are required. The BRK SC7010BV is a state-of-the-art hardwired with battery backup smoke/ CO combo alarm that features a photoelectric smoke sensing chamber, an electrochemical CO sensor, an End of Life signal and voice warning with location. This exclusive feature incorporates a voice that will speak one of 11 pre-programmed locations and the danger detected. The Spread Spectrum Horn Tone has a lower and varying frequency that makes it easier for the elderly with normal age related hearing loss to hear the horn. This alarm features two latching features and two silence features. Alarm Latch: Easily identifies initiating alarm even after alarm condition has subsided. Low Battery Latch: Identifies which unit is in low battery condition by blinking the green power light. Low Battery Silence: Temporarily silence the low battery chirp for up to eight hours. Alarm Silence: Silence alarm for several minutes. Other features include an 85dB horn and silence. OptiPath 360 Technology provides 360 degrees of direct access to the smoke sensor. Two locking features are provided to prevent battery theft and/or theft of the unit. Connection to AC power is made with a Quick-Connect wiring harness.